We're all familiar with Simon, the electronic game that has players repeat an ever-increasing pattern of colored button pushes, but let's go back to the roots of handheld gaming and take a look at Atari's Touch Me, the originator of the concept. Touch Me actually started as an arcade machine, but wasn't faring so well against the pinball machines and video games of the day. Milton Bradley saw an opportunity and created their own portable version in 1977, which featured colored buttons and tones to accompany them. It was a huge success, seeing countless variations and knockoffs over the years and is still sold today. In 1978, Atari wanted a piece of the pie (can you blame them?) and released their own version, Touch Me. Could there be a bigger contrast between the two designs? Simon is round with large curved buttons, while Touch Me is full of 90-degree angles and features buttons no bigger than the nail on your pinky finger. Simon's design may have won out in the end, but I prefer the Touch Me's design as it fits into a pocket and can be easily held like a Game Boy to rapidly hammer out the patterns, but Simon is clearly better suited for more than one player. Atari's handheld does have a few things going for it. For starters, there's an LED display to keep track of score. The 'skill' button is used to choose lengths of 8/16/32/99 for games 1 and 3, or 8/16/32 presses for game 2. Game 1 is the standard mode, starting at one button and subsequently adds one for every successful iteration. Game 2 is a little different, and provides only the first button in the sequence. The player is responsible for the rest, so it's a self-test of sorts. Granted, one could just press the same button repeatedly and win, but where's the fun in that? Game 3 plays like an elimination mode. When one of the 2-4 players either misses their turn or hits a button out of order, they're eliminated and that button is disabled. The sole survivor is the winner, and is rewarded with a raspy rendition of "We are the Champions." How cool would that be. Believe it or not, this thing runs on a 9-volt battery. I'm not sure how long it lasts, and I love my thumbs too much to find out. 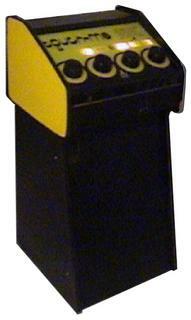 Atari's Touch Me is a piece of handheld gaming history and just goes to show how far technology has come. Wow never heard of this before but it is awesome!